: Yes. If the dimensional boundary starts to warp, it will become extremely dangerous. : We saw this phenomenon a lot during the Balmar War, didn't we? : Yeah, it signified when the Aerogators would appear. : But we drove 'em off, didn't we? 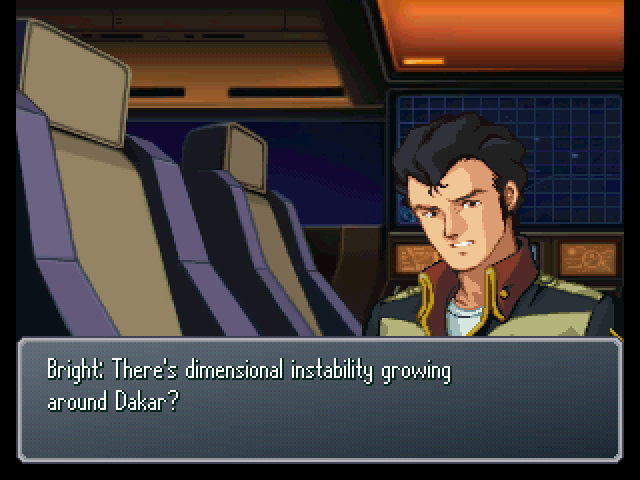 : (.........) Maybe Dakar's connected to some other dimensional thing...? : That's what I think is going on. : So then, what's the connection...? : What is it, Tyutti? : We've seen phenomena like this in La Gias as well. : In the half year since the barrier of harmony was destroyed... Surely you've seen all the effects of spiritual power growing unstable. : And the gates, contact points between La Gias and places like the Bermuda Triangle... Something big is opening one, it seems. : ...The sheer scale of it is what's bothering me. And we can't pinpoint gate positions on the La Gias side. : Maybe Dakar is where the gate's opening up? : Don't tell me La Gias is coming to invade the surface...? : No way. There are hardly any La Giasians who would meddle with the surface. : Yes, we made an extra-special exception to come investigate that gate. After all, we can only pinpoint the location where it opens from the surface side... It's also very likely that someone's opening the gate from the the surface side, too. : (.........) And Feil allowed you and the four Elemental Lords to travel to the surface? : (...It's unheard of for every single Elemental Lord to come to the surface... Well, that goes to show how seriously Lan Gran's taking this. Which would mean...) Cenia, is Shu the one behind this...? : Come on, it's obvious this is all his fault! : Hey, don't jump to conclusions yet. : In any case, we need to be even more cautious if we're heading towards Dakar. 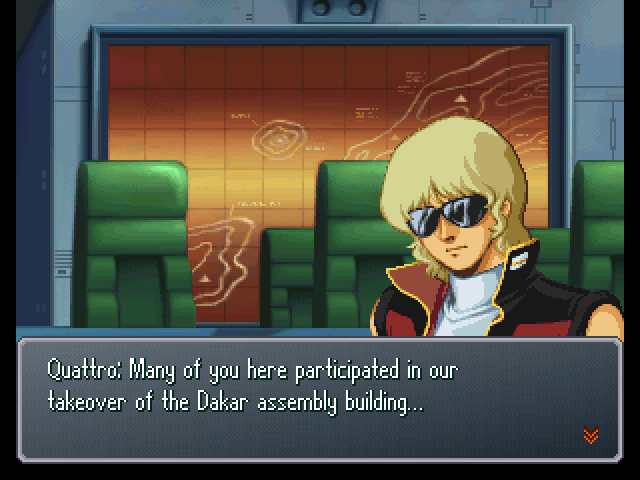 : Captain Bright, may we accompany you to Dakar for our investigations? : Sure, I don't mind. 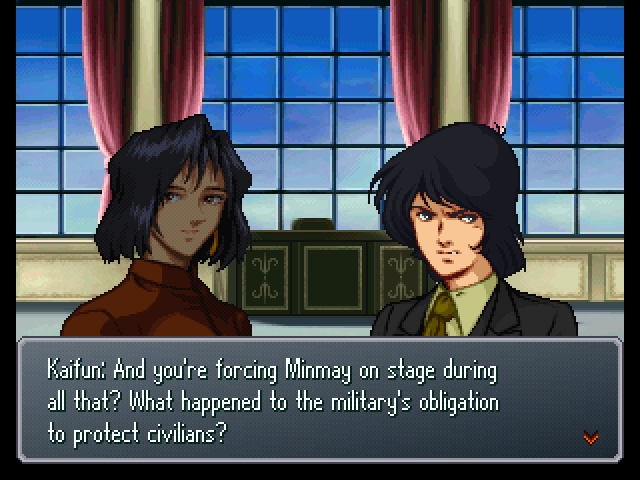 We're concerned about Dr. Shirakawa's movements as well, you know. 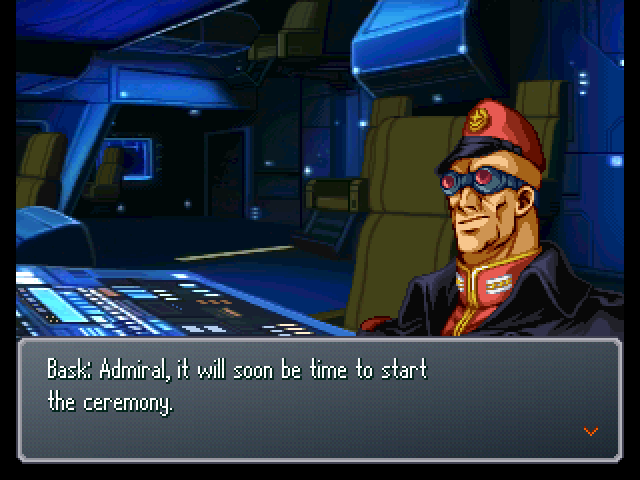 : Captain Bright, it's time for the briefing. 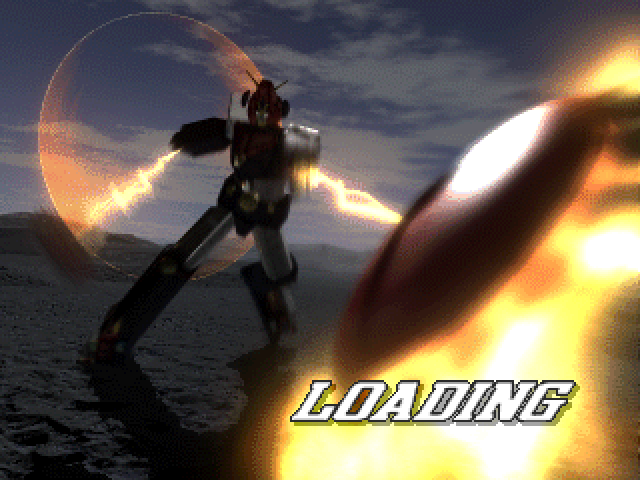 : Let's use our giant robots to beat the bad guys! : I have a policy never to get into fights that don't involve clients. : Oh, is that so? Guess that'd make sense. : (.........) Kid, what do you want to do? : (.........) I never did like the Titans' way of doing things. I'd like to give 'em some trouble too, if I could. : (.........) Bowie? Omachi? What about you two? 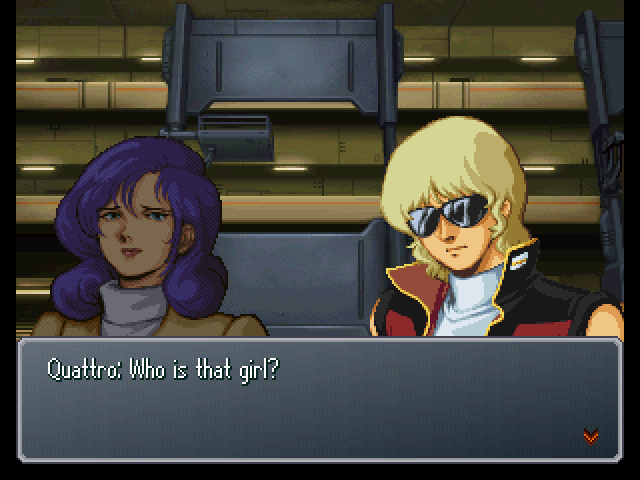 : If it means I can meet Lynn Minmay, that's enough for me. : I'd rather avoid death by shockwave, so I'm with Kid. : (.........) Then it's decided. : You sure about this? : I also have a policy never to overlook evil deeds done in plain sight. : Master! If you say any more, we'll get in trouble! : Oh yeah, whoops. My bad! : We can't exactly let her off here, you know. : What is it, Hyouma? : Brother! I brought you something to drink! : Sortie? 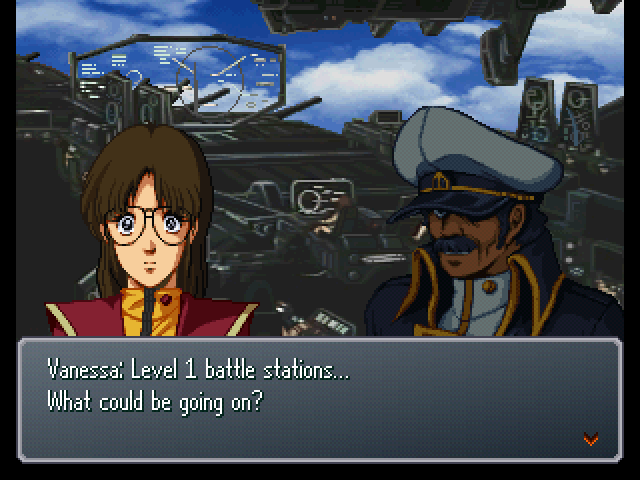 You mean, get in your Mobile Suit? : Yes, that's right. So you should go back to your room now, Rosamy. 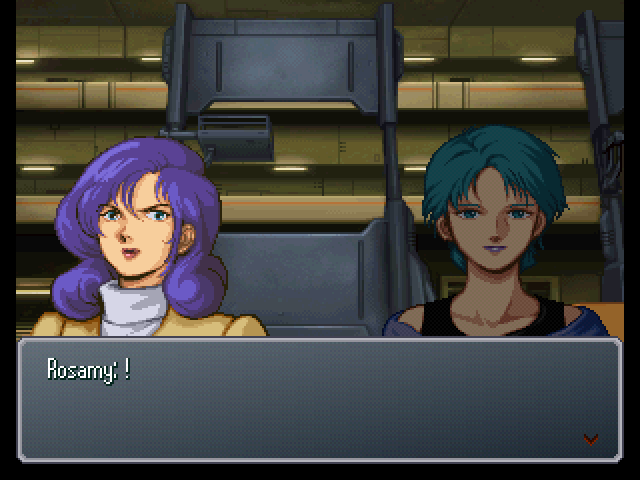 : Kamille's younger sister, apparently. 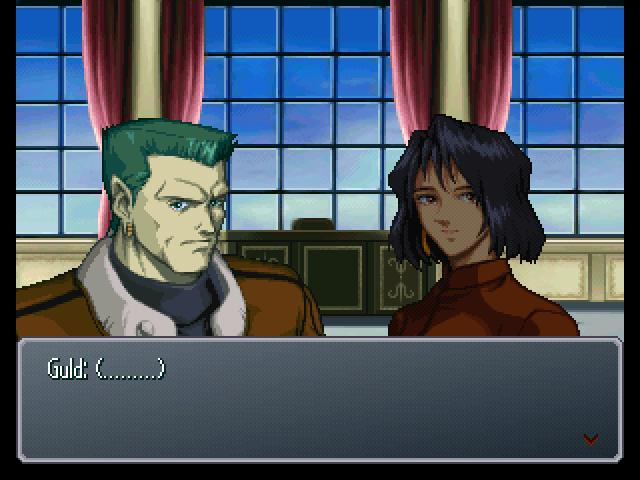 : Does she catch your eye, Lieutenant? 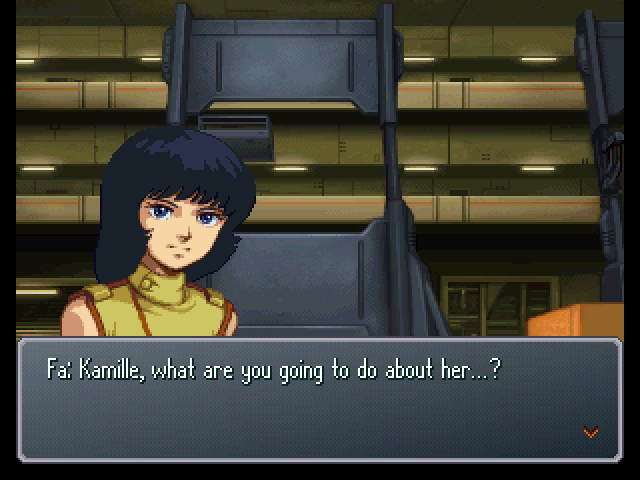 Puru runs up to Kamille, with Four following. : I don't like these people...! : If we can keep it at its present level, it should be possible for it to supply energy to Project Aegis's gravitational shield. : I see... Then, go ahead and submit the report to the Titans, too. : I guess not. And this ship can't fly right now, either. 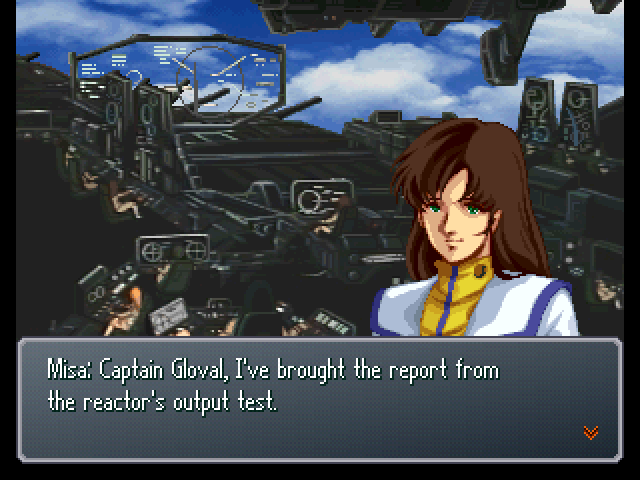 : But if its reactor can supply energy to the gravitational shield, Mankind can be saved from the shockwave. 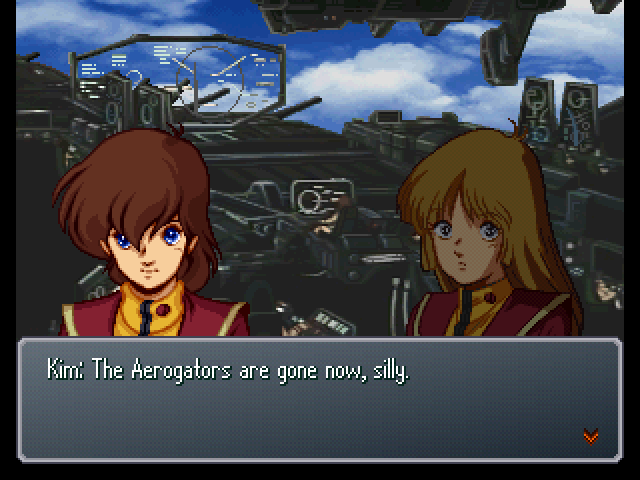 If not, all the sacrifices we've made, like the SDF's Class 0 flagship, will have been in vain... And there will have been no point in surviving through the Balmar War. 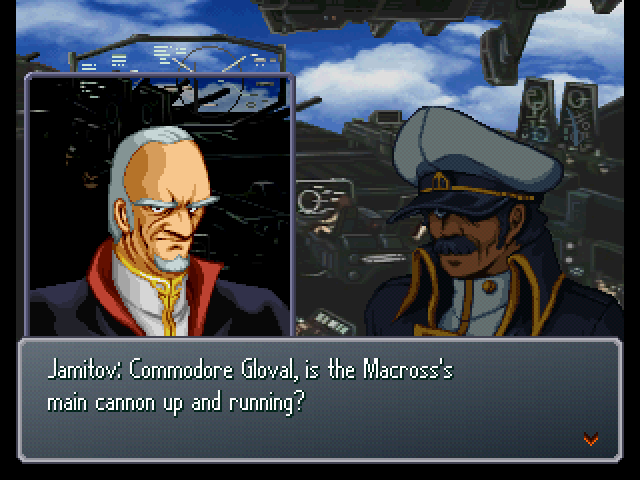 : You're right, of course, Captain. 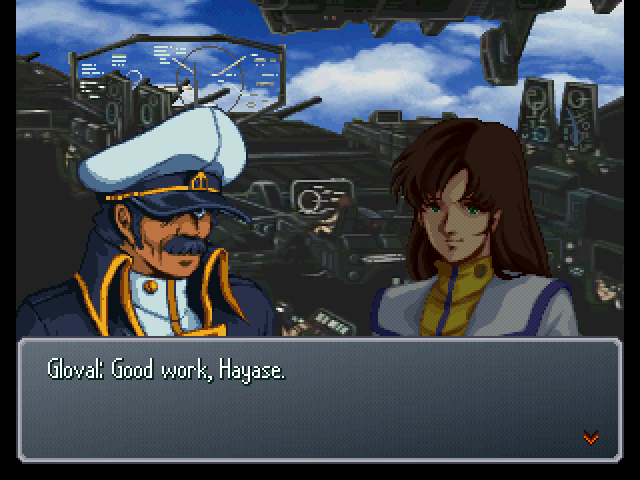 : By the way, Hayase... How are repairs going on other sections of the ship? : Ah... er, yes. Most of the armaments besides the main cannon are online now. : With the Titans over our heads, we're better off not using the main cannon anyway. : No, sir. 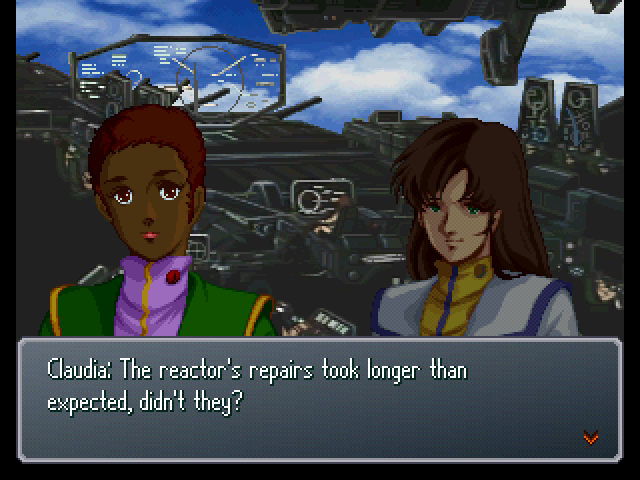 But we have finished repairs on the reactor. : Very well, then. Keep the Macross on standby at level 1 battle stations. : Level 1 battle stations? 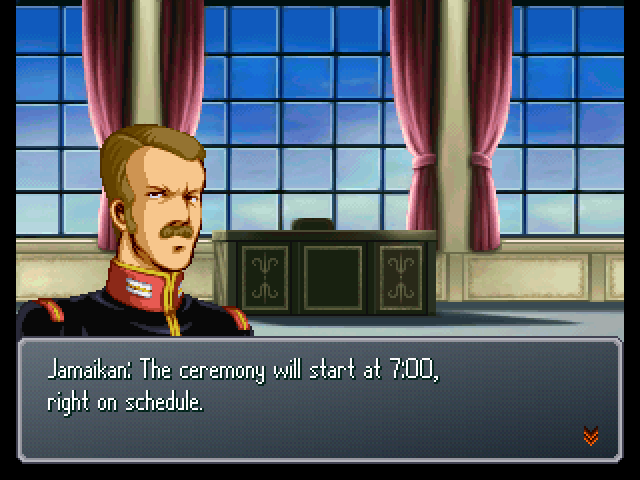 Isn't the presidential inauguration ceremony tonight? : The Titans will be in control of the Macross's weaponry. All of you former SDF main members are to attend the ceremony, as well. That is all. : Is this the start of another war? : No way... The Londo Bell? : But the Londo Bell was dissolved, wasn't it? : I hear the remaining members formed a new organization. 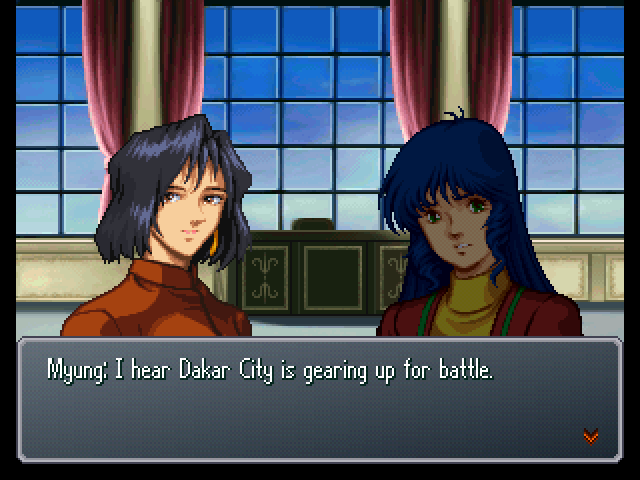 : So they're coming to attack Dakar...? : The deployment is to deal with a small group of terrorists. There will be no changes to the ceremony's proceedings. And besides that, none of you have the right to reject orders. 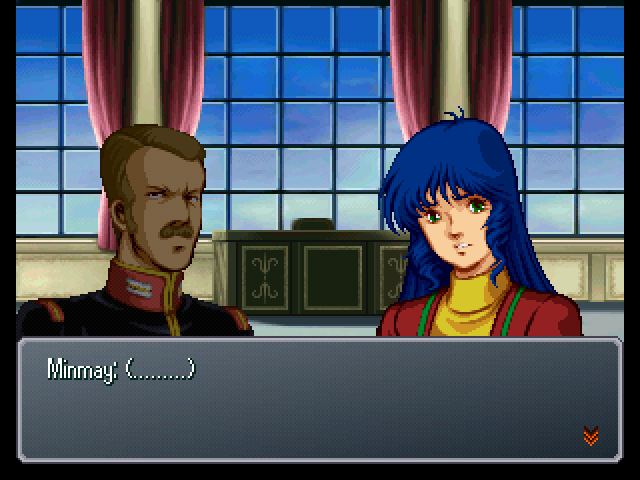 : Listen, Minmay. 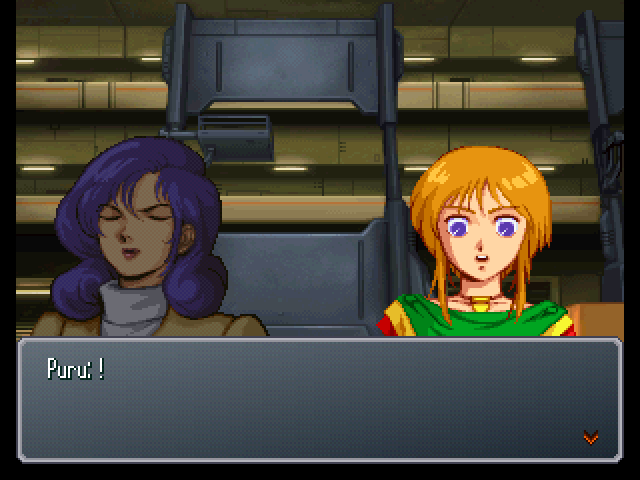 If you try anything funny, consider Ensign Ichijou dead. : And don't you forget that either, Myung. 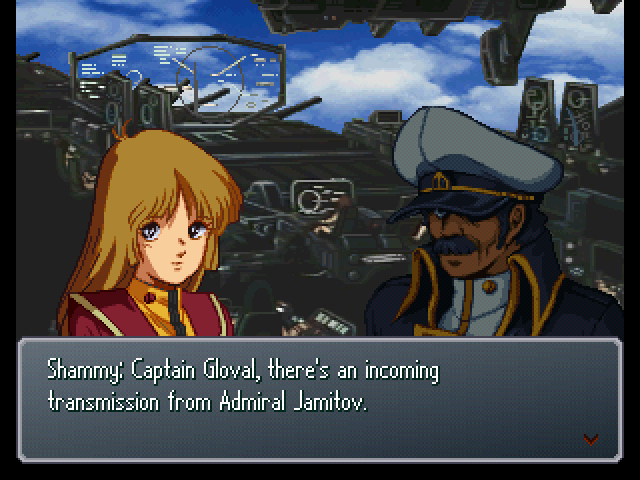 Lt. Isamu Dyson is in our hands. 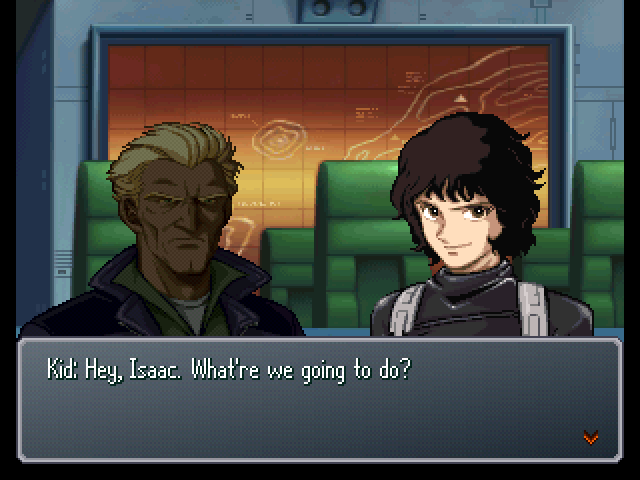 : Isamu and I have no relation. : There's no use playing dumb. We've done background checks on both of you. : I'll look forward to a good production, you two... One befitting the establishment of a new system of rule over the Earth Sphere. : This is why you can't trust military types! : And the SDF! While expanding their operations in the Balmar War... How could they let the Titans, of all people, rise to power!? : Brother, stop it. 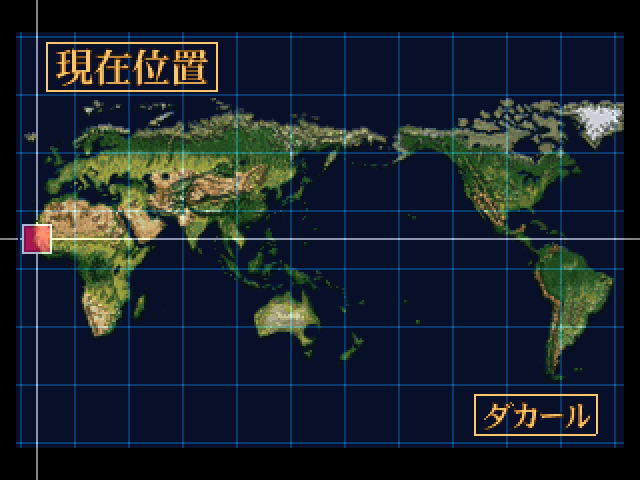 Hikaru and the others fought plenty in the Balmar War. So this time, it's our turn to fight. : Guld...! What are you doing here...? : Yes, I'm working with the Titans. : What...!? 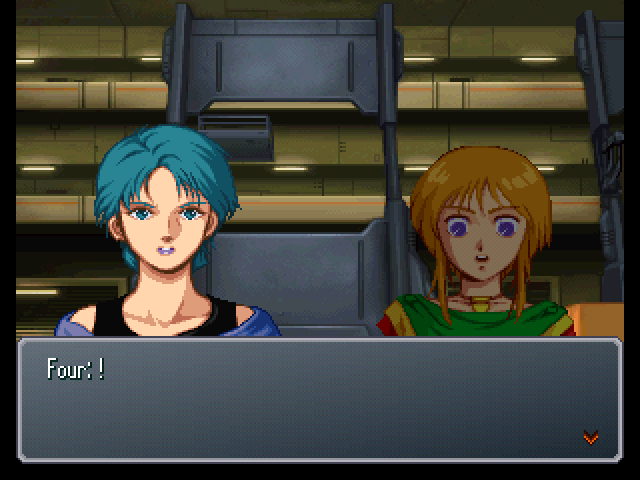 Weren't you part of the Londo Bell during the Balmar War!? : I told you, Myung... I'll protect you. : But why would you join the Titans...? : Mm... It's finally time for us to declare ourselves the true rulers of the Earth Sphere. We must leave no room for error. : We've also deployed machines piloted by Cyber Newtypes within the city. : Yes, sir. Even if the Preventers do manage to slip past our defenses, they don't stand a chance.